PITTSBURGH (CNS) — The Diocese of Pittsburgh has eliminated all fees for those seeking an annulment in the diocese. The decision, announced April 1, took immediate effect. “I know that the fee has stood in the way for many who are in need of an annulment,” said a letter from Bishop David A. Zubik of Pittsburgh to Catholics in his diocese. Typically, those seeking annulments have paid up to $650 to the diocese, which covered about one-third of the costs, according to Father Thomas Kunz, a canon lawyer and the Pittsburgh diocesan tribunal’s judicial vicar — analogous to a chief judge in civil law. Some applicants have paid less in circumstances where they did not have to go through as many steps in annulment process, said Father Kunz, who also is spiritual director for the diocese’s college seminary and diocesan episcopal vicar for canonical services. Others had to pay more depending on the complexity of the case, he added. The cost of changing the policy is being borne by the diocese’s annual appeal, called Our Campaign for The Church Alive. This year a grant from the campaign will subsidize two-thirds of the estimated $120,000 in fees collected annually, with the remainder borne by regular operating funds from the diocesan parish assessment system, called Parish Share. Over four years, the campaign funding will diminish so that by the fifth year, Parish Share will cover the full cost of annulments. One exception to the no-fee annulment process is if the applicant appeals the Pittsburgh tribunal’s decision to either the Archdiocese of Philadelphia or the Vatican. Only those with a clear tie to the Pittsburgh Diocese can request an annulment there. At least one of the following situations must apply: The failed marriage in question was celebrated in the diocese; the person seeking the annulment lives in the diocese — provided that his or her former spouse lives in the United States and consent is obtained from the diocese where that former spouse lives; the spouse who did not initiate the petition lives in the diocese; or the Pittsburgh tribunal is where most of the testimony will be collected, provided that consent is granted by the diocese of the former spouse who is responding to the petition. The average time from acceptance of a petition to a final decision is approximately 10 months. However, this time frame varies greatly according to the complexity of the case and other circumstances. Divorced Catholics are not banned from receiving Communion. 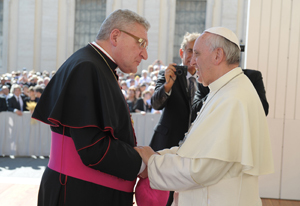 However, Catholics who have divorced and subsequently remarried civilly are prohibited from receiving it, but these Catholics “are welcome in our parishes,” Bishop Zubik said in his letter. He noted that the diocese has support groups and retreats for divorced and separated Catholics, as well as volunteer advocates, some of whom have been through the annulment process themselves, who can offer support to those going through it. The money part was just an excuse for people not to apply. If you really can’t afford it the dioceses always waived it. If the bishop thinks that this will increase the applications he is smoking something. People don’t apply because they know they have no grounds. They made bad choices and like most people today want to blame it on someone or something else. Have hoped for 53 years Phila would make this move. People should not have to pay to be reconciled to the church. I was surprised at the hefty applicant fee for requesting an annulment. This clearly could be a financial stumbling block to many people so kudos to the Pittsburgh Diocese and Bishop Zubikfor for taking on this burden and giving everyone in need the same opportunity. Kudos also to Pope Francis for acting as a catalyst to move this needed change along throughout the Church. I dare say if each and every parish allotted a Sunday or two each year for a brief homily and special collection for covering the handling costs for member parishioners seeking Church help in determining if they have grounds for an annulment, the response from the parish would be overwhelmingly generous.